We are not just a bunch of gringos who would prefer that Chile stop developing its wonderful country. Nor are we opposed to hydropower. We are residents of this planet who support the cause of countless Chileans endeavoring to stop the profit-driven damming – the "electrocution" – of the global treasure that is Patagonia. If the European-owned energy giant, ENDESA, gets it way, Chilean Patagonia’s largest and wildest river, the Rio Baker, will be dammed. To connect the resulting glut of power to the Chilean national grid and the growing network of inefficient copper and gold mines in Chile’s far north, ENDESA is scheming to build a 2000km transmission line through the biodiverse heart and soul of Chilean Patagonia – degrading sweeping vistas and plowing roads through nature reserves. Once the transmission line is built, it will only be a matter of time before the remainder of Patagonia's wild rivers fall, and the rich mosaic of ecosystems that define Patagonia is torn to pieces. Thanks to everyone, and think snow! 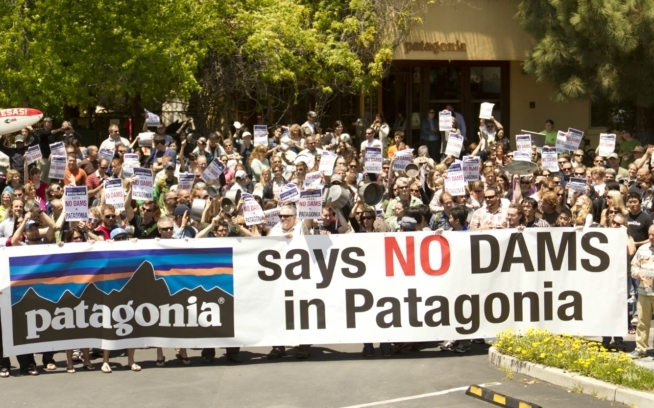 For even more on the issue, please visit "Action Alert – Don't Dam Patagonia" at Patagonia.com. Thanks to Brian and Emily for starting the Dirtbag Grant off right.